Since before Robert’s Rebellion, House Lannister has influenced the fate of Westeros. Under the masterful leadership of Tywin Lannister, this family has become the power behind the Iron Throne, holding such lofty positions as Queen Regent, Hand of the King, Warden of the West, and Lord Commander of the Kingsguard. Their gold, their cunning, and their ruthlessness have made the Lannisters undeniably powerful, but they have also created enemies. In the north, House Stark seeks justice for the execution of Eddard Stark. Stannis and Renly Baratheon raise armies to reclaim their brother’s throne. The Martells of Dorne plot bloody vengeance for Elia’s death, while the reavers of House Greyjoy covet the wealth of Lannisport. 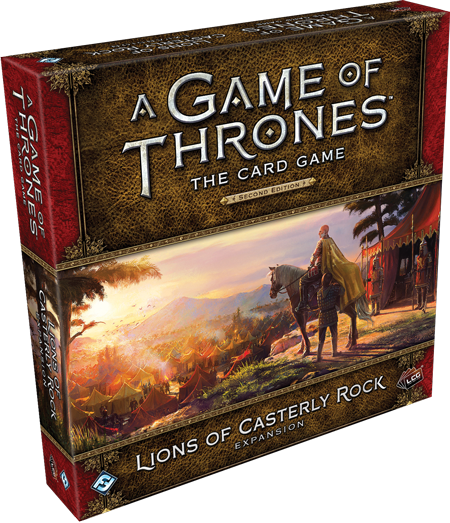 Though the Lions of Casterly Rock deluxe expansion for A Game of Thrones: The Card Game is primarily focused on House Lannister itself, you’ll also find new non-loyal cards for every other faction, alongside seven new plots to expand your options for any deck. 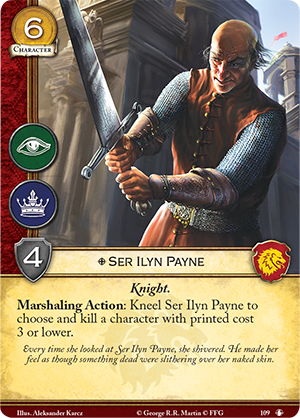 Today, we’ll look at the factions with good reason to hate the Lannisters with the Martell and Greyjoy cards from Lions of Casterly Rock! From the city of Sunspear, House Martell has long ruled over Dorne, seemingly remaining aloof from the game of thrones. The truth, of course, is that their show of inaction and contemplation only conceals their machinations as they seek to bring House Lannister crashing to the ground. 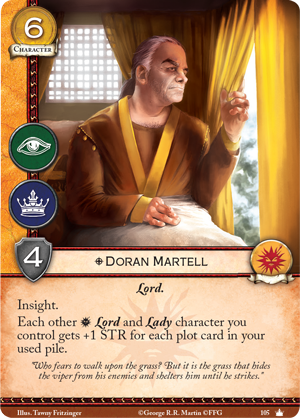 Each of Doran Martell’s children have a place in his schemes, and with this expansion, you can bring Trystane Martell (Lions of Casterly Rock, 29) to join his older siblings, Arianne and Quentyn. 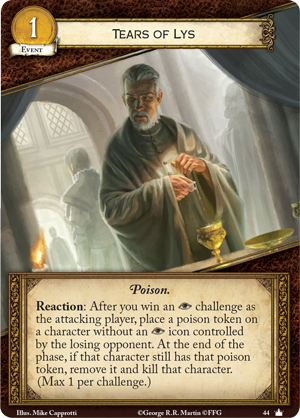 When considering Trystane Martell for your deck, your eye may first be drawn to his raw stats. 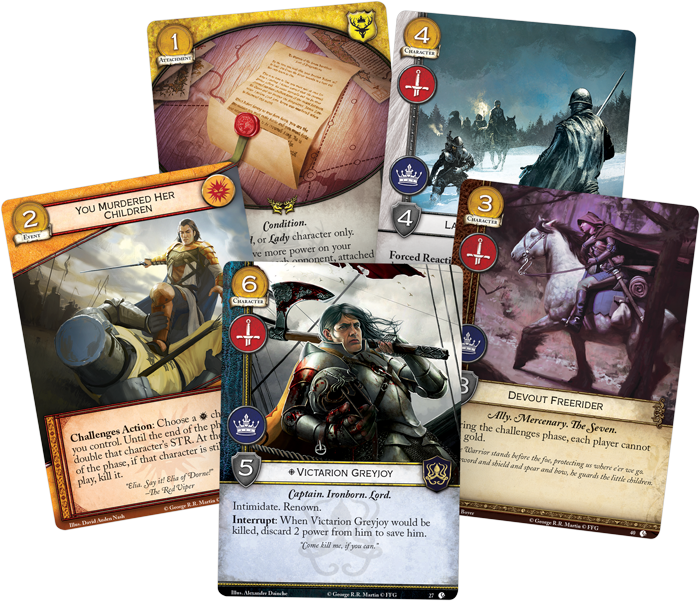 With four STR and two icons for only four gold, Trystane significantly contributes to your board presence, while costing enough to dodge effects like The First Snow of Winter (No Middle Ground, 79) or Ser Ilyn Payne (True Steel, 109). Importantly, Trystane Martell is also a Martell Lord, instantly making him more powerful in combination with Doran Martell (Core Set, 105). 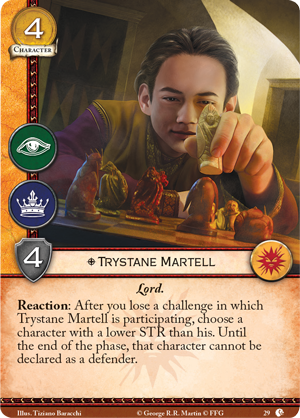 You’ll also notice that Trystane bears a Reaction: “After you lose a challenge in which Trystane Martell is participating, choose a character with lower STR than his. Until the end of the phase, that character cannot be declared as a defender.” At the outset, this ability may seem to work against itself. After all, as Trystane’s STR becomes higher, he can target more powerful characters—but to trigger his ability at all, you have to lose the challenge. In many cases, however, it’s better to think of this ability as softening the blow of losing the challenge, rather than something you should actively try to trigger. 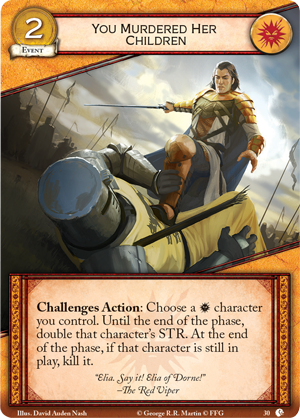 In combination with Doran Martell, Trystane’s STR can become very high, but if you do happen to lose a challenge in which he participates, you’ll be able to weaken your opponent’s defenses. 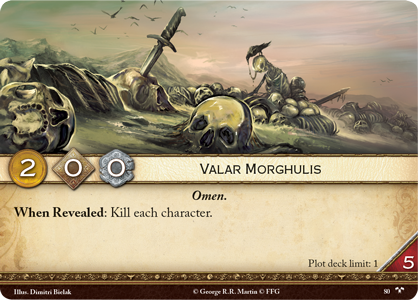 House Martell also gains a new event in this expansion, inspired by one of the most iconic scenes of A Song of Ice and Fire. This event— You Murdered Her Children (Lions of Casterly Rock, 30)—lets you choose one of your Martell characters and double that character’s STR until the end of the phase. At the end of the phase, however, you must kill that character if it’s still in play! Clearly, this event is meant for desperate circumstances, but that makes it no less powerful. 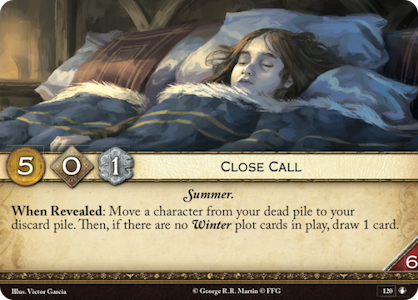 The obvious application is to use You Murdered Her Children with The Red Viper (Core Set, 109) to drastically increase the power that he gains with his Reaction. 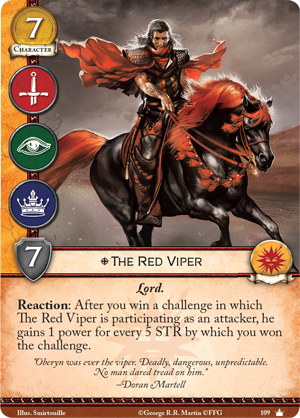 If you can win the game during that challenge, it hardly matters that The Red Viper would die at the end of the phase—you’ve already accomplished what you needed to. 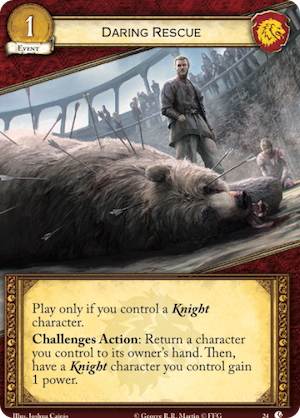 Though using this card on The Red Viper is perhaps the most extreme example, you can certainly imagine games where you need to win a crucial challenge to close out the game or kill one of your opponent’s most important characters. In many cases, winning this challenge could be worth losing one of your own characters, especially if you have a plot like Close Call (True Steel, 120) in your plot deck. Arianne Martell is an ideal target for You Murdered Her Children, since she can return to your hand before she would be killed. And that isn’t even considering the other ways the Martells can dodge the final consequences of You Murdered Her Children. If you play it on a character with duplicate, you’ll be able to save your character from death. 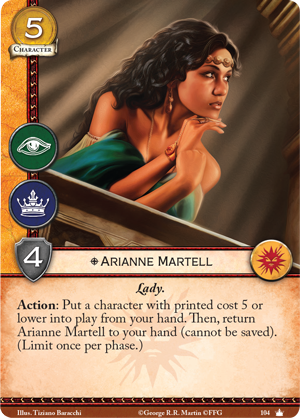 Arianne Martell (Core Set, 104) can bounce back to your hand before she’d die, Iron Mines (Calm Over Westeros, 92) can save your character, and you may even ally with House Lannister itself to stage a Daring Rescue (Lions of Casterly Rock, 24). The Martells are far from the only House with reason to oppose the Lannisters. During the Greyjoy Rebellion, Balon’s first offensive was burning the Lannister fleet that harbored at Lannisport. 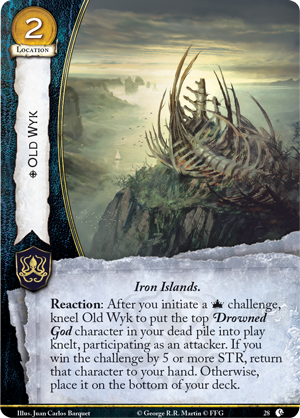 Though the rebellion was ultimately crushed, the Greyjoys have never forgotten their humiliation—and few could better lead House Greyjoy back to dominance than the Lord Captain of the Iron Fleet, Victarion Greyjoy (Lions of Casterly Rock, 27). 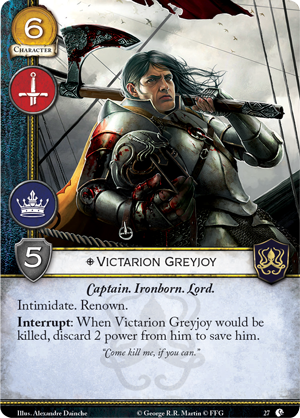 Few characters in your deck offer more brute effectiveness than Victarion Greyjoy. He boasts a significant STR, combined with two potent keywords: intimidate and renown. More than that, however, Victarion gives you a way to save him from death. Whenever Victarion would be killed, you can simply discard two power from him to save him! 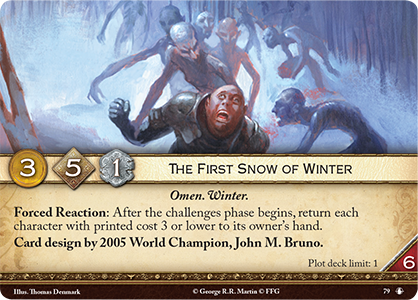 Obviously, this can protect him from treacherous events like Tears of Lys (Core Set, 44), but it can also free you to use plots like the upcoming Valar Morghulis (There Is My Claim, 80) in an offensive capacity, saving your own characters while wiping out your opponent’s. If your characters do find their way to your dead pile, you’ll find a powerful way to recur them with Old Wyk (Lions of Casterly Rock, 28). This location can be triggered after you initiate a power challenge to put the top Drowned God character in your dead pile into play as an attacker. If you can win the challenge by five or more STR, the character goes back to your hand; otherwise, it’s placed on the bottom of the deck. Either way, you’ll be able to get unique Drowned God characters out of your dead pile, enabling you to play another copy from your hand. 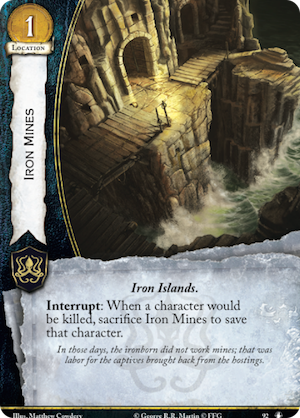 You can even use this location in combination with Victarion Greyjoy to boost your total STR in the challenge, making his intimidate keyword that much more powerful. The Lannisters have rested upon their gold, their power, and their cunning for far too long. Even as they grow in power, your faction of choice has a chance to prove its mettle by smashing the Lannisters in the only game that matters—the game of thrones. Pick up your copy of Lions of Casterly Rock at your local United States retailer on November 3rd!